Our primary focus is on inputs and management over late pregnancy to achieve fast complication-free births, because when we achieve this, appetite potential and reproductive health are maximised. MCM for Calving Performance, is our flagship product. Of course there are a variety of wintering regimes, springer and calver mob management preferences and diet considerations. So we have an expanding range of products designed for use pre calving. In addition we manufacture customised mixes. Working out what fits with your objectives and situation is where our field team come in – to determine the best solution/ programme, taking into account workable delivery routes. MCM CALVING is a combination of trace elements formulated for their contribution to, and impact on the birth process, vigour and appetite of both cow and new-born calf, immune response, and calcium metabolism. MCM CALVING is used starting prior to calving and continuing through early lactation. It is available in soluble powder, feed-out wagon premix, and liquid formats and can be added to concentrate mineral pellets. 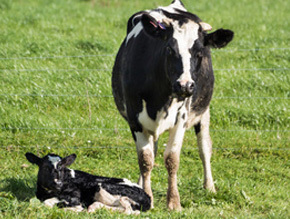 Expected outcomes from the use of MCM CALVING include reduced calving related deaths; greater ease & speed of birth resulting in less assisted births, pinched nerves, & down cows; fewer retained membranes; reduced severity of milk fever; more rapid post calving recovery to appetite; improved response to antibiotic treatment for mastitis, increased calf survival, vigour and sucking drive. Increases in production occur as a direct result of fewer complications – energy and protein that would otherwise be diverted to recovery can go into production. Furthermore, post calving health influences the rise to peak production and resultant intake which this sets the potential for the season. Improvements in reproductive performance follow on a direct result of complication free calving. Whilst there is an absolute requirement for adequate trace element status over mating, trace element inputs starting prior to calving have the greatest impact. Starting with pregnant cows our attention is to achieve a fast complication free birth delivering a vigorous calf and leaving the cow able to get on and eat right away without needing to recover. During the dry period, we need to make sure the cow doesn’t sacrifice her trace element reserves to the un-born calf, and our focus is also to charge the cow up with a specific combination of trace elements going into calving. LCL is a high strength salt based free-access trace element mineral combination. It is not food-like nor a feed supplement and is formulated to smell mildly attractive but not taste desirable. For supplementing cattle grazing fodder beet LCL FODDERBEET combines LCL with phosphates so has a dual purpose design. The relative need for trace elements vs phosphate has resulted in three variants; two suiting dairy cows and the other more suited to young-stock. Depending on the proportion of fodder beet in the winter diet, and where there is a calculated need for additional phosphate, supplementing with DCP (e.g. on straw or silage) is the recommended first choice. Where this is not possible, or results in an inequitable supply, EZP4 BEET is indicated. As a free access source of phosphate, it can also be used to determine if stock are looking for (more) phosphate. In this way EZP4 BEET can be made available alongside LCL or LCL FODDERBEET. Getting magnesium into cows three weeks prior to calving is recognised by industry as the way to build soft tissue (cellular) magnesium. Magnesium oxide, or magnesium sulphate and magnesium chloride are the recommended inputs to do this. Where you do not have a way to deliver these products (i.e. can’t dust and no way to treat water supply) then MAGNET 175 is indicated. It was designed to target the mob closest to coming back to join the springer mob. Pre calving vitamins, designed to support immuno-competency, especially in respect of retained membranes and mastitis infections, and to enhance colostrum quality. Added to feed, concentrate mineral pellets or via trough dispenser for springer/ calvers. PREMO is a springer premix for adding to watered down molasses, which can then be delivered on hay straw or baleage. It contains MCM, CALVITS and magnesium. PRECONDTION’ER is a free access product designed for springers where it is not possible to apply a springer premix to silage or feed. This is designed to be used instead of LCL for this mob. Designed to deliver Calcium and or Magnesium and trace elements. Custom design allow additions of other ingredients.